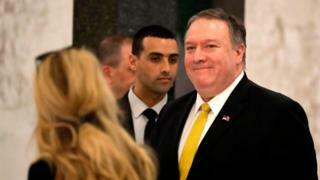 "As a Christian, I certainly believe that's possible," said Mr Pompeo, a former member of Congress for Kansas and CIA director. Mr Pompeo is not the first Trump official to suggest a divine will behind Mr Trump's actions: In January, White House press secretary Sarah Sanders told a religious television network that God "wanted Donald Trump to become president". His administration is also the first in 100 years to have a Cabinet member bible study group - of which Mr Pompeo was a member. Do more people believe in God in Trump's America? In May 2018, Mr Trump withdrew the US from the Joint Comprehensive Plan of Action nuclear deal, calling it "a horrible one-sided deal". On Friday, his administration imposed new sanctions on 14 individuals and 17 organisations allegedly involved with Iran's nuclear programme, claiming Iran would not answer questions about its weapons and research. And the threat of secondary US sanctions also discourages other countries from doing business with the targeted entities, making them "radioactive internationally". In recent days, Mr Trump has accused his Democratic rivals of being "anti-Israel" and "anti-Jewish".